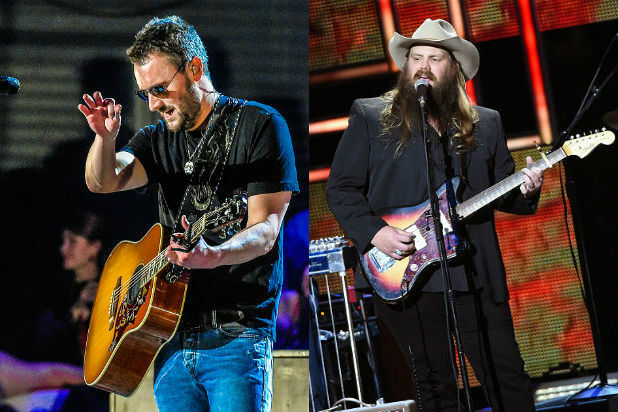 The 51st Academy of Country Music Awards were announced on Monday, with both Eric Church and Chris Stapleton racking up five nominations each to lead the pack. Church is nominated for his first Entertainer of the Year and third for Male Vocalist of the Year, as well as Album of the Year for “Mr. Misunderstood,” Video of the Year for “Mr. Misunderstood,” and Vocal Event of the Year for “Raise ‘Em Up” with Keith Urban. Stapleton’s five nominations include his first-ever nods for Male Vocalist of the Year, New Male Vocalist of the Year, Vocal Event of the Year for “Hangover Tonight” with Gary Allan, and is twice nominated as both artist and producer in the Album of the Year category for Traveller. Little Big Town, the reigning Vocal Group of the Year, leads group nominations with four, including their tenth nomination for Vocal Group of the Year. The group earned nominations in the Single Record of the Year and Video of the Year categories for the song “Girl Crush.” Little Big Town also received a Vocal Event of the Year nomination for “Smokin’ And Drinkin'” with Miranda Lambert. Additionally, Little Big Town’s Karen Fairchild received an individual nomination for Vocal Event of the Year for “Home Alone Tonight” with Luke Bryan. Reigning Female Vocalist of the Year Miranda Lambert earned three nominations, including her fifth for Entertainer of the Year and 10th consecutive nod for Female Vocalist of the Year. Additionally, she is nominated for Vocal Event of the Year for “Smokin’ And Drinkin'” featuring Little Big Town. This year, the previously fan-voted Entertainer of the Year and Newcomer categories, New Male Vocalist of the Year, New Female Vocalist of the Year and New Vocal/Duo of the Year, are now all incorporated into the professional membership voting process. The 51st Academy of Country Music Awards, which will be hosted by Dierks Bentley and reigning ACM Entertainer of the Year Luke Bryan, will be broadcast live on CBS from the MGM Grand Garden Arena in Las Vegas April 3 at 8 p.m/7c.